I have not posted before about email or page layouts because there is already so much more out there that has been tested by others. Today, though, I am making an exception for a particularly bad email I received from Citibank regarding one of my credit cards. Overall, Citibank is fine, except I receive a continual stream of emails attempting to make me feel better about my credit card. I confirmed I opted out of the promotional emails, but they must believe that these emails aren’t “promotional” but “operational” instead. I then clicked on the “manage preferences” and discovered a new layer of permissions that weren’t part of the preferences in my actual logged in account. It is hard to say if this permission error was intentional or simply due to complexity. This disconnect highlights just how important it is to have a consistent and clear subscription management system. I recall Jud Linville used to work at Amex, so this was news to me that he is at Citi. But why in the world would I care about an update from him? I don’t feel better that the CEO is communicating with me since it is clearly a mass email. Again generic, but the “info4” subdomain is a bit odd. Why not “email.citi.com” or something more trustworthy? I thought this email was so poorly constructed, I checked the headers, as it seemed like a great phishing email. Banners: When you speak, we listen. This is a giant banner for a preview pane and I am now thoroughly confused about why they want to send me an email. And I get two banners for my trouble, one logo and one secondary header. This lede fails copywriting and email etiquette in several ways. First, I have no reason to continue reading. Second, you just wasted my time with an email and then say you want to save me time. I am unimpressed and would have deleted this email already but I found it so terrible, I kept reading. Body: I won’t repeat it here, so you can read it yourself. Essentially, Jud lists out changes that many other card issuers already had several years ago. These are also features I do not use or care about right now with Citi. The addition of an Android app is pretty meaningless unless you happened to know I use Android or I requested it. Then I am asked to download the app OR click to learn more. I am now confused as to what clicking will do or why I want to click. Finally, I am asked to leave more feedback in both poorly placed image and a final text request with no hyperlink, but instead he asks me to find the “green button”. My email and page design rules are all about not making the reader work to find the information or to take action. 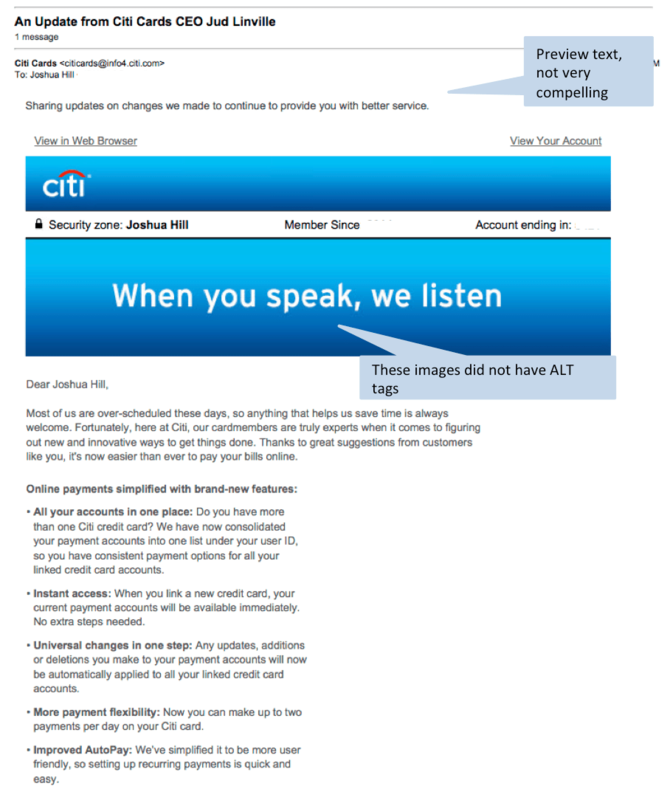 Some Ux designers call this “frictionless.” Citi’s site and emails are full of friction. Essentially, Jud sent me a promo email detailing why Citi is so great, and wasted my time on a feature list and asking for feedback with multiple CTAs, after just saying that I must be very busy and don’t have time for things like this. Header image is too large and uninteresting. Lede actually repels the reader because it is already clear this email is a waste of my time even though they want to help me save time. I did not ask for this email, or at least I thought I did not ask for it. At least 3 CTAs that conflict with each other. No links where I would expect links, such as the app download or feedback request. The copy is self-serving because it asks me to do what Citi wants without any clear benefits and to take time from my day to provide product feedback that is likely unneeded. What could Citi have done better? Update the website to point out the new features the next time a user logs in. If I navigate to an area that has been upgraded, point out the new features in a natural way, and only once. All of these features exist on other card sites already, so I would already look for them if I wanted them. (In fact, the autopsy feature was so terribly designed that it didn’t work and it did not explain how it worked when I first received my card a year ago). Ask for feedback on the site, and not with one of those pop up surveys. 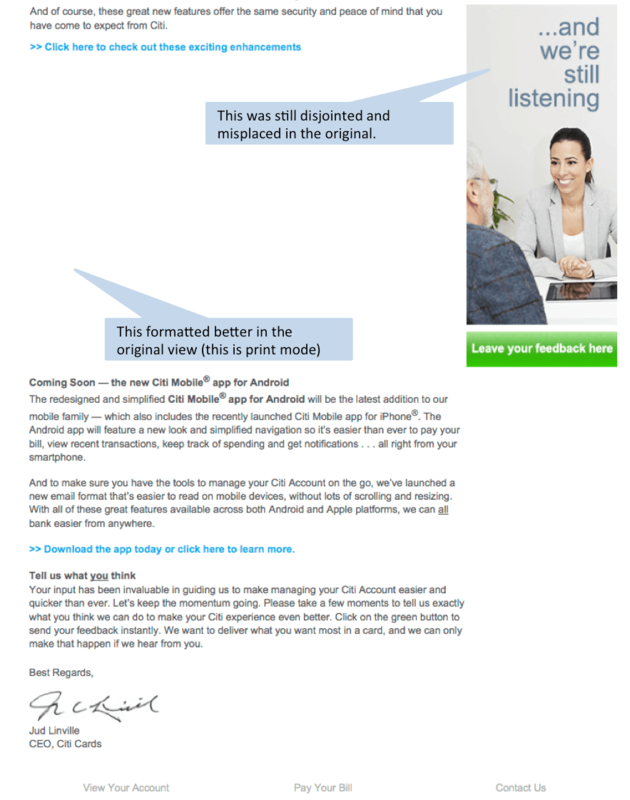 Mobile downloads – if you want to increase your mobile downloads, then point me to it on the website with a direct link. Or perhaps your system noticed I sometimes use my phone to look at your emails and now you know I use Android, so send me an invitation to just the Android app with a direct URL to the Google Play store. Give me a real reason to use the app by allaying security fears or making the app a necessity for me. Keep emails to twice a month unless it is related specifically to my account, such as a bill, overdue notice, or security breach. While I won’t critique all aspects of citi.com, let’s look really quickly at Citi.com vs. Americanexpress.com. 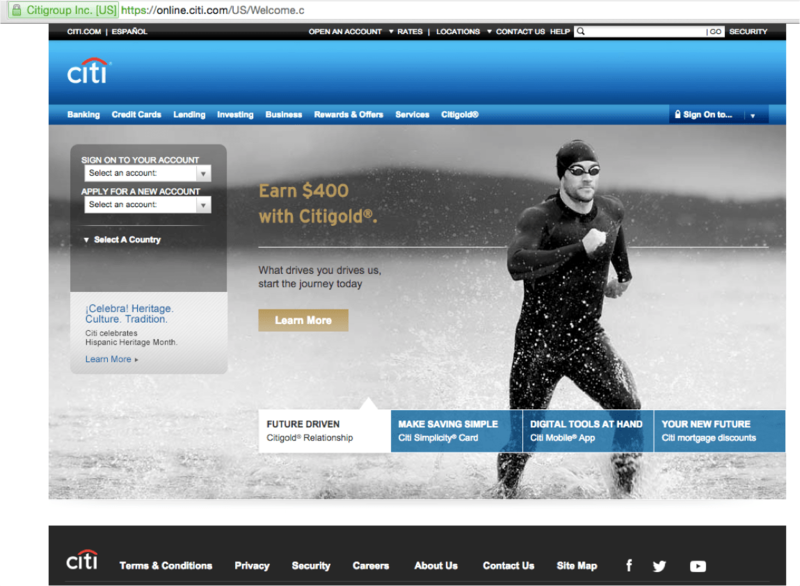 On citi.com, we are presented with a splash page (literally). In the upper left, I am invited to login, but there is only a small set of picklist drop downs. It took me several months before I finally realized the two boxes are not connected and that I should select “Credit Cards” just to get to the login page. Why is Apply so close to Login? Is this a security issue? Is it the result of poor backend decisions in 1999? The top banner is a giant amount of wasted screen real estate that could be used for the navigation. While the rotating CTAs are fairly visible, I almost never notice them since I am too busy trying to find the login box. Note how the CTAs on this page are not clearly connected to my personal goals, other than wanting $400. 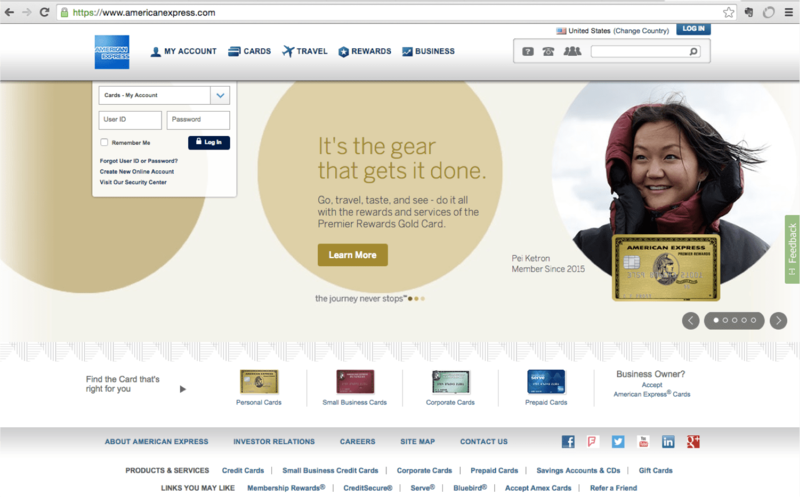 Now, take a look at americanexpress.com. The login box is displayed clearly in the upper left. While the rotating CTAs still use muted colors and are tied into how my card enables my travel goals. The entire screen is easy to read if I chose to. The menu is clean and fresh looking and it is clear where I should click. I also see the classic Amex card images, which tell me where to click and what I should expect. None of that is present on Citi. In the Reuters article I linked to earlier, they mentioned how Citi Cards were at the forefront of the card market in the 1980s. I recall the many spots they used to run and it was a clear tie (in my young mind) between Citi and Amex. It is interesting that Jud Linville hasn’t been able to take many of Amex’s lessons and psychology expertise to Citi.com. This is not to say Citi.com should emulate the latest Silicon Valley startup scroll down page, but there are lessons from those designs which could help Citi’s customers. What are your challenges in bringing good design practices to your firm? Did you use a marketing automation implementation to re-design your templates? Quite a few people ask me, “What are good benchmarks to measure myself against?” Often this question occurs as a company is optimizing their lead funnel or reporting so that is it is more reliable. The marketer then wants to know if 10% of leads go to MQL (marketing qualified lead), is that good or bad compared to the rest of the world? Before you benchmark externally, benchmark internally first. Have a few months or even a year of solid data where you can see the daily or monthly change in funnel movements. Marketo’s Revenue Cycle Model is a good starting point. After several months, there is enough data to say your Engaged to MQL rate is 7%, for example. If you see one month is at 12% and another is at 2%, then investigate the marketing activities going on then. Perhaps it was Christmas and leads stopped picking up the phone, or perhaps that big content program was a flop. Only once you have a clear funnel conversion rate can you ask about external benchmarks. These benchmarks are difficult to find for free, or at all. Through careful research, I have collected several credible papers for sales funnel numbers and email deliverability. Best of luck preparing for 2015! Over the past several years of content marketing, video has been a much touted format and yet the least understood by most B2B marketers. With the advent of marketing automation, the need for compelling content is greater than ever before. Video can help fill the need, but it is often viewed as expensive, time consuming, and hard to measure. Many marketers continue to use video for “branding” instead of for lead nurturing and information transfer. Often this is because video is not easy to tie back to results. In the Marketo Community, I have seen several video consumption questions pop up. The tracking is difficult until Vidyard’s solution. I recently spoke with Vidyard’s CMO, Tyler Lessard about his firm and how Vidyard integrates with marketing automation (and Marketo) to provide clear statistics and attribution for video consumption. Josh: How did you become involved with Vidyard? Tyler: In late 2013, I met Michael Litt and Devon Galloway, Co-Founders of Vidyard, through a mutual acquaintance in the Venture Capital community. Michael and Devon are two of the most reputable entrepreneurs in my home town of Kitchener, Ontario, and I found this to be a great opportunity to learn more about the evolving technology landscape right there in my own backyard. What started as an innocent conversation about the growing tech scene and the state of local entrepreneurship quickly turned into a fascinating discussion about marketing technology, the power of online video as a marketing and sales tool, and the evolving role of video marketing platform technology in the B2B market. Being passionate about both marketing and technology, and having spent over 15 years in various marketing and business development roles within B2B markets, it didn’t take long to gain an appreciation for what Vidyard had built and where the company was going. I got so excited about the business model, the market landscape, and what Vidyard was developing that we quickly began discussing career opportunities. One thing led to another, and not long after I decided to join Vidyard as Chief Marketing Officer. 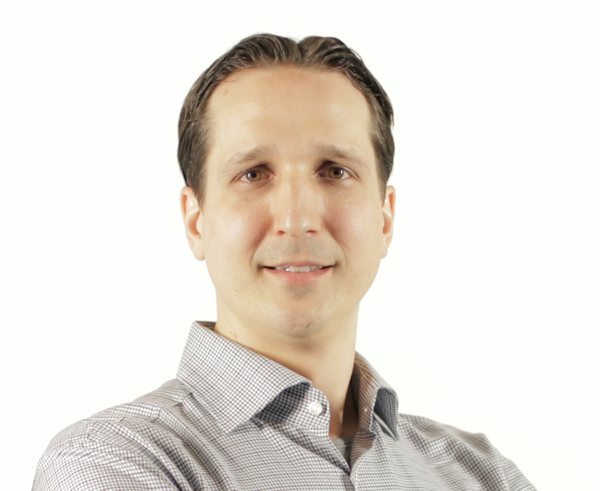 Josh: I suspect most marketing automation admins and all campaign managers agree video is becoming essential to pulling leads through the funnel. All would agree video is expensive to make. What do you recommend for cash strapped marketers who know they need video, but are not sure how to do it well and for a reasonable cost. Tyler: Video is becoming a mainstream component of the content marketing mix, yet many organizations still treat it as a special, one-off content medium reserved for major campaigns or projects. It’s time to move past that and to start thinking like a media publishing company within your own marketing organization. Hire one or two great video producers and you’ll be amazed at the volume, and quality, of video content that you can create and push out. That’s not to that agencies aren’t important – but you can’t rely on them for all of your video production needs or you’ll be second guessing every product video, customer testimonial, and campaign video that you want to produce. Here at Vidyard, for example, we have an in-house Creative Director who is a whiz behind the camera and proficient in post-production software. He films and produces all of the videos on our website, including some of my favorites like the animated “Tale of Two Marketers” and the hilarious Back to the Future spoof. All the scripts and graphics are developed by our content marketing team. We inject video into almost everything we do, and the resulting engagement levels by our online audiences are remarkable as a result. Allocate the budget for one or two people dedicated to video and it will be worth every penny! Josh: You are pioneering the concept of scoring leads based on percentage of content consumed. I know you do this for video, but how might one apply it to white papers, web pages, and even events? Tyler: One of the reasons we are so passionate about video is that it’s an ideal content medium for marketers – not only because audiences love it and you can tell compelling stories through it, but because it is a highly measurable content medium that can offer amazing insight into customer intent. Because video content is streamed from your server, you can track every second of consumption if you have the right video technology in place. By doing that, you can actually score leads based on the percentage of the video they actually watched, not just based on whether or not they hit “play.” This type of progressive lead scoring allows you to dynamically score leads based on actual consumption of the content, rather than binary transaction like “clicked on a link” or “downloaded a whitepaper.” This is important because a lead that actually watches 3 minutes of a product video is likely a much hotter prospect than someone that downloads a white paper and never reads it. We do this here at Vidyard where we will often assign 5 points if someone starts a video, another 5 points if they make it past 50%, and another 10 points if they it past 90% of the video. That said, it is difficult to do consumption-based scoring on whitepapers and web pages because they are not streamed content types. There is no meaningful way to know how much of a web page someone actually read. And with whitepapers, there is no way to track engagement in a PDF unless you are using a third party technology that is presenting the document over the web in a proprietary format and tracking page clicks. Still, it’s hard to know if someone actually read the content, or if they simply skipped past numerous pages to the end. Josh: Vidyard encourages scoring by percentage of content consumed as well as total content consumed per day. Would you really say that a lead who watches 2 hours of video this week indicates the lead is as highly qualified as one who requests a call back? Tyler: Every organization is different in how they associate value to different actions taken by a prospect, but the most important thing is to be able to track the most relevant qualification data available and attribute points that best correlate to intent-to-purchase. I would definitely argue that a lead that watches 2 hours of video in a week is more qualified than one that visits several web pages and downloads two whitepapers, yet most marketers don’t score video views today and thus the lead that watched a lot of video will walk away unnoticed while the other will likely surface as a marketing qualified lead for immediate follow up. A prospect that requests a call back is certainly well qualified, as is one that consumes a great deal of video content. Marketers need to be smart in what data they track and how they assign points to ensure that each of these leads get flagged for follow up at the appropriate time. It’s also worth noting that not all pieces of content, nor all videos, are created equal. We typically assign more points to views of videos that are further down the sales funnel. For example, we may only assign 10 points to a lead that watches the entire brand awareness video, while we will assign 30 or more points to a lead that watches more than 5 minutes of product demonstration videos. Josh: Marketing automation managers often struggle with measuring video content. A common question on the Marketo Community is “How do I score based on length of view time?” Would you tell us more about how Vidyard helps you do this without being a programmer? Tyler: This is one of the core functions that Vidyard is built for. When you publish a video to your website via the Vidyard platform, it automatically tracks every second of every video view by visitors to your website. Through its integration with Marketo, it automatically identifies if the viewer is a known prospect in your Marketo system, and if they are, the Vidyard platform pushes the video viewing results right into the associated lead record in Marketo. It’s really as simple as that. The activity log of a Marketo lead record is now updated with the name of the video they watched, how many seconds they watched, and what percentage of the video that represents. Using the standard tools in Marketo, you can specify custom rules for assigning lead scores, for segmenting users based on their viewing history, or for initiating automated nurture activities in response to a viewing activity. It’s a very powerful solution, and it leverages the native tools in Marketo so the marketing operations team doesn’t need to learn new technology or do any custom programming. Josh: Tyler, you place an emphasis on the CTA in the video. With YouTube and other platforms offering this rich experience, how can a marketer use a CTA effectively? Should a video CTA always say, “Call us now?” or can you weave together several videos and CTAs to let the lead create his experience that tells (sells) him your story? Tyler: We always say, “Never let your video fade to black.” If a viewer has made it to the end of the video, they have demonstrated interest and intent, and now is the time to ask them to take the next step. With Vidyard we make it easy to add a Call-to-Action (CTA) to the end of the video without having to edit the video itself. A CTA may tell the viewer to call a number, visit a URL, or to download a certain content asset. We also enable automated post-roll actions to jump to another place on the web page upon video completion or to auto-start another video that is next in the playlist. The right CTA depends entirely on what the intent of the video is, and what action you want the viewer to take next on the path to conversion. Josh: Now that you’ve closed the loop on video and marketing automation, what other technologies and content formats do you see on the horizon? Tyler: Many of our customers are now expanding usage of Vidyard beyond the walls of marketing and out into the Sales team. We offer a comprehensive integration with Salesforce.com, enabling individual sales reps to track the viewing habits of their prospects within CRM records and even send videos directly to clients and track if (or when) they actually view it. This can be a very powerful sales prospecting tool for both inside sales reps and account executives. We’ve also seen customers use Vidyard for distributing internal sales training videos, with the ability to track which sales reps have actually viewed which training videos. This gives managers better insight into how engaged different reps are, and to correlate consumption of sales training to effectiveness in the field. Last, but not least, by tracking video viewing history inside the CRM’s leads and opportunities, we enable the sales and marketing teams to report on the actual ROI of each video asset. Through a simple Salesforce.com report, they can see which videos have influenced the most pipeline and closed revenue. Having this data handy can be critical to understanding what’s working, and to justify additional investments in video content production. Josh: What do you do for fun? Tyler: I love to watch superhero movies, go to the local water park, read Fancy Nancy books, and take long trips to Disney World. Sometimes, even with my kids!! Oh, and if I ever find time to golf again, we’ll add that to the list. But don’t hold your breath. Stay tuned in for a tutorial on how video content is tracked inside Marketo using Vidyard. How have you been tracking video? Let us know in the comments below! Today I had the privilege of speaking to Howard Sewell, President of Spear Marketing Group. Spear has been a strong presence at the Marketo User Summits for several years and Howard continues to offer the community his expertise in a variety of ways. If you haven’t heard of Howard, you probably have come across Spear’s free Marketo template offers and Top 10 Webinar papers. Howard probably doesn’t realize this, but he is one of the people I continue to look up to in the Marketo Community because he took the time to speak with me way back in 2010 when I had just started with Marketo. Here’s what Howard had to say about his work in the B2B marketing world. How did you get started in marketing automation? I’m an old-school direct marketer. I started my marketing career in direct mail back in the late 1980s at Oracle. After Oracle, I ran my own agency for 19 years – at first, focused on direct mail, and later expanding to demand generation, and clients were always asking how we could help filter, qualify, and nurture the sales leads we were generating for them. Those questions led to getting involved in marketing automation, and ultimately to joining Spear in 2010. Tell me about your approach to client engagements. Our most successful client engagements are those where we’re a genuine partner and not just a vendor. Much of the value we bring to the table is in the area of fresh ideas and best practices, and so we’re most successful when we’re involved from strategy to execution. As an agency, if you’re executing on someone else’s vision, you’re simply bandwidth for hire. Most of our clients run Marketo. There’s no one platform that’s right for everyone, but we really like Marketo’s functionality, the user interface, and the fact that it enables our clients to measure the true revenue impact of demand generation programs. Plus I think they’re a great company. What’s been your favorite engagement so far? Navicure is a small, growing software company in Atlanta – we’ve been working with them for years and they make us feel like we’re part of the team. That kind of trust and confidence allows us to do great work. For pure cool factor, we’ve done a lot of work for Google, and they’re absolutely a fun company to work with. I appreciate the way they empower their people to make decisions – it gives a marketing agency like us the ability to really push the envelope. By the time this is published, we’ll be at 30, which will mean we’ve tripled in size in a little over 3 years. We’re one of the only true, full-service marketing agencies that really knows its stuff when it comes to marketing automation. Most service providers in the MA space – many of whom do really great work – are basically systems consultants, whereas clients hire us more for things like lead management strategy, campaign development, and creative execution. We’re a very specialized agency. First, 90% of our clients are B2B technology companies. Second, the work we do is generally either demand generation (e.g. feeding the funnel) or lead management. We help our clients generate, nurture, and convert leads to revenue. On a day to day basis, that means we’re designing or building everything from PPC landing pages to lead nurturing emails to large scale, global campaigns. Do you have a Package or Pricing Summary? We really don’t – every engagement is unique. We work on both a project (fixed fee) and retainer basis. What kinds of firms would find you the most helpful? If you’re a B2B technology company that needs to generate more leads, generate better leads, or do a better job converting the leads you have, we can help. Cooking, cycling, and watching our two kids grow up. What’s the best way for marketers to get in touch? And I’m back to full time consulting with Marketo and Demand Generation. Let me know if you have a project – hello [at ] marketingrockstarguides.com. I am continuing my Marketing Automation and Demand Gen Leaders series with an interview with DemandLab founder, Rhoan Morgan. Rhoan is CEO of this boutique firm based in Philadelphia. Rhoan founded DemandLab in 2009 and has grown the firm into what I would call a full service demand generation agency. Since my first conversation with her last year, I have known this is someone to both watch and admire. Let’s learn from her today. I fell in love with marketing automation when we deployed Marketo in a company I worked for. Until then, we were pretty much just tossing leads over the fence to the sales department using our CRM, with zero insight into the needs and behaviors of our prospects and customers. Marketo changed everything. It was a revelation, and I knew this was where the future of marketing—and my future—was headed. Why did you decide to start your agency? 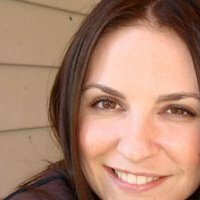 After working as an independent consultant with a handful of clients for about a year, I founded DemandLab so that I could give clients more complete, integrated services. This expansion brought in staff to support deployment and implementation while I could provide more focus on strategic advisory. Also, we found that many clients deployed these great systems and then said, “Now what?” They didn’t have the fuel to power the engine: professionally designed and written content that creates brand awareness and guides prospects skillfully through the funnel. So we further expanded into offering design and content services to help our clients take their efforts to the next level. As a consultant, I learned to collaborate closely with my clients. As an agency, we follow the same approach. We do a lot of listening and learning to understand the client’s business holistically and build on the experience and expertise of their marketing team. We also prioritize structure, because we’ve found it results in a smoother project experience and a better end result. We hired a full-time project manager this year, and we use Clarizen to keep projects on track and moving swiftly. What’s your favorite marketing automation platform? That’s a tough question. My “first love” and my area of greatest expertise is Marketo, but when it comes to choosing the right platform for a client we will keep options open and consider the business need of the client. Everyone’s needs are unique, which is why it’s great to have so many strong marketing automation options to choose from. It’s really hard to choose, but ultimately I’m most proud of the work that produces highest levels of return for a client or pushes the envelope with respect to what we think the technology can produce. As part of a recent Marketo deployment we also included a newsletter “makeover” that’s saving our client about $300,000 each year. We have seven people on staff, including consultants, a designer, a content strategist, and a project manager. We also team with partners when a project calls for an expertise outside of our core capabilities. Because we structure every engagement as a tailor made project to deliver quick wins and long-term value; and have the capabilities to jump in and create a turnkey program that can be quickly implemented. We live and breathe marketing automation, so we bring a wealth of innovation, best practices, and practical experience to every project and we pass that expertise on to our clients so that they can continue to create success within their organization. We specialize in ensuring the optimized use of a client’s marketing automation system from pre-deployment planning to implementation, integration with other systems, and leveraging the MAP to support all marketing efforts. A big focus is on end-to-end lead life-cycle management, helping clients map out the life cycle of a lead and move that lead through their systems efficiently, from initial touch to conversion and beyond. Our approach is different because it takes both technology processes and people processes into consideration. People often forget the “people” part of the equation, but the system has to work for the inside sales person and everyone else who has a role to play. We also provide content and brand development when clients need help laying the groundwork for an effective campaign. No matter how finely tuned your marketing automation system is, you won’t see results if you’re not sending excellent content and spot on messaging. We offer a range of packaged services, including marketing automation audits (a complete audit of your existing system and setup), marketing automation deployments, managed services, content planning and creation, positioning, persona development and consulting. Value-driven companies. Because we’re very focused on optimizing ROI, we’re a good fit for companies that want to see more value from their existing system as well as those that want to make a wise investment in the technology. Global companies. We have experience deploying solutions for global organizations, which tend to require more process mapping and training engagements to bring disparate teams together, and accommodate different priorities and work styles. Smaller marketing teams. Having design and content specialists on staff allows us to deliver fully integrated marketing campaigns to companies that may not have the capacity to create new marketing assets in-house. Also, offering managed services packages mean we can keep the engine running while smaller teams focus on strategic efforts. Hang out with my husband and four-year-old daughter (reading, playing, and learning as much as possible). And when I want to relax I try my hand at baking a really complex dessert. When I want to get full of energy and excited I read about and plan my ultimate productivity process (I know that is really geeky but I won’t be satisfied until life is seamless – which means I’ll be at it for the next 50 years!). Best way to get in touch is by emailing contact [at] demandlab.com. And remember to stay with me this month – new Marketo How Tos are underway.